Blogmas day 14 gives you a full review on the Soap and Glory 2-in-1 Pore Purifying Mask and Peel! I’ve been testing this product out for around 6 weeks now. I purchased mine in Boots, on a whim whilst it was around £6.60, although the usual price is at the £10 mark. This is definitely the most expensive face mask I’ve ever purchased but I had read so many positive reviews on it, I just couldn’t help myself. It really helped that it was also on sale as it made the decision to buy it, a lot easier! This mask is specifically allocated for those with oily/combination skin, which I definitely do have. The box says you’re supposed to massage into the face and focus on the t-zone. Now, I don’t like the texture of this mask at all so I do use it with a brush and once it is on my face I like to gently run circular motions around my face to really let the product sink in. It does give you the option of just leaving it for 5 minutes to give you a quick refreshed look. Otherwise, you’re able to leave the mask on for around 15 minutes to give your skin a deep clean and you can do either of these from 1-3 times a week. I only really use the mask twice a week as I find that it has helped so much. At first I was using it 3 times a week, Monday, Wednesday and Friday. However as the weeks have gone by I’ve started to reduce the days because I don’t feel like I need it as much. I do leave it on for 15 minutes at a time though and normally apply before I go in the shower so I can use the hot water to really rinse it off. I was confused when I first applied this product because I assumed that it would dry and become a peel off face mask, which it didn’t do at all. The title says it’s a 2-in-1 facial mask and peel but really, it’s just a standard mask. However, with that in mind, it has worked amazingly on my skin. I don’t find that my pores get as clogged as they used too anymore. Generally, it just helps to maintain how clean my skin is and really does help to reduce redness and acne. Although, this isn’t a mask that does help to reduce spots completely. I can’t say that this mask has changed my life but I do honestly believe that it really does help to remove any dirt from the skin and just help to create a healthy refreshed look. The texture of my skin does feel better when I use it and I do like that I have the option to pick whether I want to use it for 5 or 15 minutes, dependant on what I really want. So whether I’m heading out for the night and want something to make my skin feel and look better before applying makeup. Or if I’m spending the night in and want to give myself a good pamper, this face mask is something that I would go too. Especially if you have a problem with pore clogging and oiliness. This mask has really helped to reduce the amount of oil the I have during the day! Would I say it’s worth £10? Probably not, I’d actually say around the £6 mark but it is Soap and Glory and I trust their products since I know they do work so well (Not all but most). Have you tried this mask? let me know what you think! Are Beauty Advent Calendar’s Worth The Hype? Beauty Advent Calendar’s have been raved about for years now but especially more popular these past 2/3 years. I’ve had my eye on the benefit ones for a while now and this year I finally caved and got it. However, what happened to the usual chocolate advent calendars? Are we just too advanced for the simple things in life? The Benefit calendar isn’t the only one available, there are so many from ASOS, Soap and Glory, Makeup Revolution and so many more. Generally the calendars do range, I paid £34.50 for the Benefit calendar and it has 12 days of luxury sized products. For the price you do receive some decent sized products and a lot of them are some of the best sellers. Do I think they’re worth it though? I do think some of them are most definitely worth the money. Although some, such as the Zoella Advent calendar is high priced and you receive a pen as one of the items. I think a calendar that is above drugstore pricing shouldn’t be giving out pens unless it has some form of cool advanced action like it doubles up as a sword. Same again for the ASOS calendar, how can they expect customers to be happy with a 20% discount?! We get them all the time. Don’t get me wrong, I like my calendar but I don’t think I’ll be repurchasing one go Christmas 2018. I like the simplicity and novelty of a chocolate advent calendar. Christmas is my favourite time of year but I especially enjoy the 3 main days of Christmas with my family. It’s definitely the 1 time a year that we truly get on and put our differences behind us. My mum really tries her hardest every single year to make Christmas the most perfect time of year and without fail she always does. Her every effort during November and December is to make sure that her family, our family, receive the best Christmas ever. She never fails us. With that in mind, my mum begins to prepare for Christmas in September, which might seem crazy but her first wages in September contributes towards gifts, decorations and food to help us have the most incredible Christmas ever. For those 3 days, we have the most incredible time. Don’t get me wrong, as a I child we did experience it differently but as an adult, I’m so grateful and appreciate everything at Christmas time and it does help me to realise everything that I am grateful for throughout the year. Christmas Eve in our house is generally pretty chilled, from the early morning mum will be preparing and start cooking the meat for our rather large Christmas dinner. Generally, each year we have turkey, beef and chicken to see us through Christmas Day and Boxing Day (you’ll learn why). This might seem a lot but we have a large family and really, can you over eat at Christmas? Once I’m finally awake I’ll help mum prepare vegetables, sort out the chocolates, crisps etc. For as long as I can remember, mum has always put out chocolates, crisps, nuts and Bombay mix as snacks around the living room and kitchen area. We don’t get to eat these until Christmas Eve afternoon as technically, this is when we start celebrating our Christmas. We also make sure the house is fully clean by the afternoon and perfect ready for when we finally settle down. By the afternoon when we have finished preparing, we all try and settle down in our Christmas Eve pjs, after having showers and baths, to a Christmas film. My mum visits our neighbour to wish him and his family a merry Christmas so my brother and I like to hang out together, eating snacks and starting celebrating our Christmas. Mum always works either Christmas Eve morning or Boxing Day morning (sometimes the afternoon) as she works in a residential home. Therefore, we don’t open any gifts until mum comes in from work. So for the morning my brother, sister in law, niece and nephew will go and visit Jade’s family before finally coming to our family home around 11am with some of the kids toys for us to play with them. They’re always so excited so we like to do everything we can to help them have the best Christmas too. We have either Christmas music playing or a Christmas film at all times during December and we try and make sure we don’t eat too much food so we can indulge during the afternoon. We also like to go and visit my nan whilst mums in work to make sure she’s OK, give her our gifts and spend some time with our relatives! It’s one of my favourite parts of Christmas Day as I’m so grateful that the family all come together. A few minutes before mum comes home I’ll put the vegetables on the hob and start cooking and once mum comes in she’ll take over, the woman is an absolute god. Then we finally get to open our gifts together and we always let Gracie and Ethan dig in as soon as she gets home as they do get inpatient. Each year we all have our own little corners of the living room and every year, Gracie (my 7 year old niece) and I share a corner because we just love to open our gifts together and we love to see what each other received. Once everybody has opened our gifts we generally just chill, watch a film and look at all the wonderful things we received before having the most incredible dinner. We don’t own a table so I always eat my food sat on the floor with the kids but I wouldn’t have it any other way. We all make such a mess of ourselves because well, they’re children and at Christmas, there are no rules. So whether they manage to throw mashed potato everywhere or pinch each other’s food. We don’t mind, as long as they’re happy. Once our food has settled, we don’t stop there.. dessert is everybody’s favourite in our house. Mum always has a massive selection from chocolate cake, cheesecake, profiteroles or fruit bowls. Whatever we want, we get and it’s incredible. After a few hours of lounging around, playing with the kids and enjoying each other’s company (more than likely a little bicker here and there from my brothers and I, we start to play games for the rest of the evening before finally settling down for bed. The kids, Jade and Kyle do go home around 7/8pm to settle the kids down because it will have been a long day for them. However, Boxing Day in our house is our absolute favourite! At some point during the day we manage to see every single member of our huge family, all our relatives stop by ready for mums infamous homemade chips, cold meat and salad. We love it, it’s a total win in our house and every year the house is filled with love, happiness and total manic. It’s incredible. The kids have the best day spending time with each other (there are many, many children. We have music playing, games going, laughter spreading throughout the house and so much love like you can’t imagine. Honestly, I couldn’t ever imagine not spending Christmas with this crazy bunch. Most importantly, I’m so incredibly thankful for my mum who every year, manages to make Christmas in the Davies residence an absolute dream. I recently shared 5 secret Santa ideas for girls so I thought, it was only right to do it for guys as well. I find buying gifts for guys so hard and if I don’t know them all that well, it’s even harder. Secret Santa is hard enough as it is without the added pressure of buying for someone who you don’t know well. Honestly, I struggled with this one but I figured that these 5 gifts wouldn’t really go a miss. 1. Alcohol. Find out what their favourite alcoholic beverage is and buy them a bottle. Some say this is cheating, I personally think this is a fantastic idea. 2. A gift card isn’t a bad idea at all. I said in my last secret Santa post that a gift card really is an easy buy without the added pressure. Amazon, Game or even a clothing store would be fantastic options. 3. What sports do they like? A tv show maybe? You can get so many t-shirts from Amazon now that cater for so many things. This specific t-shirt from Amazon is for those rugby players out there, it’s such a good idea and creative. 4. If the guy is creative and enjoys these types of things, I totally recommend lego. It’s so fun for any age and you can even get lego sets which let you build cars and objects from films like Star Wars and Batman. 5. A sweets hamper. I don’t know anybody that doesn’t like sweets or chocolate. Put together a hamper full of sweets and chocolates. It’s a total win! November is a difficult month since the lead up to Christmas is approaching. I don’t often buy anything new for myself throughout November because well money is tight and I know I’ll receive Christmas presents from people the following month so I try to save money. 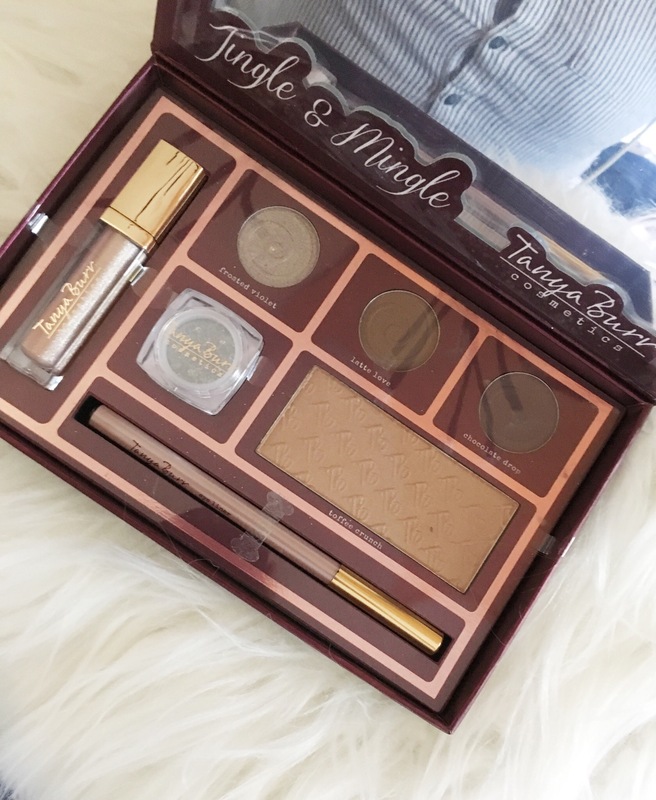 For beauty this month I’ve been loving the Tartiest Pro Glow To Go palette. I bought this in Sephora whilst in New York and I recently went back to it. It has the most gorgeous highlight tones but I really like the contour shade. When I first bought this I thought it would be to muddy looking on me but once I applied it it actually looked lovely. I apply it in small amounts and eventually build it up and it create a beautiful contoured look. Along with that, I’ve still been loving the Rimmel Stay Matte Liquid Lipstick in Coral Sass. Now I know that it is winter but I can’t help but love a coral toned lipstick regardless of the season. I just cant help myself and I’m not ready to let this lipstick go. The formula is beautiful and lightweight and I really like that it lasts for so long! Whether I’m eating, drinking or kissing this holiday season, it stays on for ages. I really love the formula so I can’t wait to pick a few more up. Although I do have favourites this month, firstly, I’ve been loving the TV show Once Upon a Time. I’ve been a big fan for a long time but season 7 has different cast and I’m enjoying how it’s been mixed up. Admittedly, the story line is very similar to the previous seasons but I still can’t get enough of it. Bonfire night is such a wonderful night, I love going to the fair and firework display with my friends and this year was extra special as I celebrated in Carmarthen! This yesr my friends went home with 4 maybe 5 fish, I gave myself sugar rush after eating a whole bag of candy floss in 10 minutes. We watched the most beautiful firework display and I just had the best night. During the summer I don’t really wear dresses and skirts but I love to match a skirt or dress with a pair of boots. I’ve been living in denim skirts and a statement t-shift recently and I’m loving it. Winter fashion is so much better than any other season! Now, something we have all been waiting for. You cannot even deny that when apple gave us Animal Crossing as an app, it was the best Christmas gift ever. Some would call it a Christmas Miracle. I’ve been loooooving this app. I play it all the time, it’s an unhealthy obsession and I may or may not need to go to rehab. I freaking love it and I feel like I can experience childhood all over again with no judging because SO many other adults are playing it too. My final favourite is spending time with my family. I went home for the weekend to spend some quality time with my niece and nephew and I had so much fun. I really forget how grateful I am to be the auntie of the most wonderful little babies. They’re both growing up so much and seeing them has just gotten made me more excited to see them at Christmas time.